It seems like to deep of a wound will only result in scar (like a cut from a knife) and too shallow wounding will not do anything (like a chemical peel or sandpaper). Could this be why Follica seem to struggle? New hair growth needs so much wounding it would not be safe or practical to use it as a treatment? » wounding it would not be safe or practical to use it as a treatment? I agree this is a great find. A lot of us have heard about this sort of thing but its something else to see it even if the photos are a frustratingly B&W. Two key things - the guy was 78 years old and it looks like a fair bit of hair. Definitely cosmetically useful. It really seemed to thicken up the hair surrounding the wound also. » » peel or sandpaper). » » wounding it would not be safe or practical to use it as a treatment? » to thicken up the hair surrounding the wound also. This isn’t a suprise to me at all. Alteration of the immune system in burns and implications for therapy. Baltimore Regional Burn Center, Francis Scott Key Medical Center, Maryland 21224. Following thermal injury profound alterations occur in the arachidonic acid cascade, and the cytokine cascade. There are further alterations in cell mediated immunity affecting all cells of the immune system, and the neuro endocrine axis. There are profound changes in humoral immunity as well. Experimental approaches to alterations in the above systems indicate that success can be obtained in restoring normality of any individual alteration in a suitable experimental model. However, before clinical intervention can be successful, it is likely that a combination of interventional mordalities will need to be used. I think the immune system response to the wounding (like in the two chemotherapy-getfitinib patients with ‘weird’ hair growth), and the human skin grafted onto immuno-deficient mice, will have to be suppressed at at least the wound site. The “good news” concerning this find is that this man’s entire immune system was not hampered, but only in the burned area. This shows that oral immunosuppressants might not be necessary if follica can find a way to effectively mute immune response in just the abraded area. Perhaps they can “shoot up” the area with syringes to get the immunosuppressants to the correct depth if a topical cream doesn’t get deep enough into the dermis to effectively mute all the myriad chemicals the immune system sends in response to a wound. If you inhibit epidermal growth factor and the immune system enough post-a wound to the depth of the stratum cornelium, you should get hair growth. It would appear that the body would almost have “no other choice”. This is an old man…and even he had enough stem cells in the area to make new hair. Long time non-posting reader here. Just wanted to share that my partner has experienced significant hair growth on a surgical wound she had as a result of CRPS. Perhaps something to add to your knowledge base on wounding etc. Sure is. Follica’s silence is deafening. If Aderans doesn’t deliver, its going to be another decade without a cure. 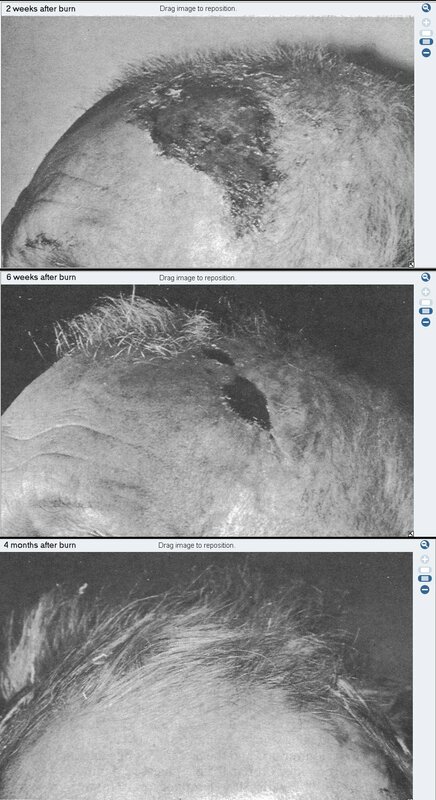 But we still have no proof or indication that the egfr regrowth patients had any wounding to the scalp. Could be a side effect from the drug alone. it would be interesting to know if the hair was permanent or it fell off after the wound healed and the immune action was restored. I am referring to the old man in the pictures. It is annoying how these important events are totally overlooked instead of being researched. » This isn’t a suprise to me at all. » Alteration of the immune system in burns and implications for therapy. » interventional mordalities will need to be used. » man’s entire immune system was not hampered, but only in the burned area. » he had enough stem cells in the area to make new hair. Benji, according to the photos, this guy had visible hair at only 2 weeks. From the photo I would say these hairs are 1cm long or so at 2 weeks. Considering that a normal plucked follicle takes more than 3 months to start growing hair again (even if the DP is intact and doesn’t need repair), I find it very surprising/suspicious to see vigorous hairs, reaching 1cm above surface, just 2 weeks after a severe burn, and after many years of total baldness. Also note that a normal hairshaft starts growing at a certain depth in the scalp (eg 5mm), so just to reach the surface would take certain time. Also, if the hairroot and DP need to be formed de novo or just repaired, this would also take some time. I would think that in an old bald man, who has severely burned his scalp, it is necessary certain time in order to prepare the root before a solid hairshaft can start being produced. Then the shaft would need additional 2-3 weeks to reach 1cm above surface level. Learn more about the latest in hair loss solutions: Scalp MicroPigmentation (SMP), Hair Transplant, FUE, FUT, Beard transplant, Eyebrow transplant. The article says that he burnt three zones: left parietotemporal region, the bridge of the nose and the left infraorbital area. The only interesting area is the left parieotemporal region (scalp region), and that’s the injury showed in the two weeks photo (forehead-scalp left region, not the entire scalp!). The other hair is what patient had, not new hair. The six weeks photo show us the photo of the scab going out but alredy without hair. The four months photo is difficult to interpret, I can’t see the angle of the photo to compare with the other photos and see the regrowth. That’s what I’m interpreting from the text and photos. » Benji, according to the photos, this guy had visible hair at only 2 weeks. » From the photo I would say these hairs are 1cm long or so at 2 weeks. » Normal growthrate is 1.2cm/month. » many years of total baldness. » scalp (eg 5mm), so just to reach the surface would take certain time. » » This isn’t a suprise to me at all. » » Alteration of the immune system in burns and implications for therapy. » » interventional mordalities will need to be used. » » he had enough stem cells in the area to make new hair. In the 6week photo you can see that no hair is growing in the burned area (left), even though it is almost completely healed. The hair is growing at the other side (right). In the 4 month photo, it seems that the burned area is still without hair (although it is difficult to see). So, I think this is probably a fake. The guy had hair before the accident, and he regrowed hair in the non-burned areas. The burned area didn’t regrow hair and as a result, became bald (it wasn’t bald before). I cannot say for sure, of course, but lets think with logic. 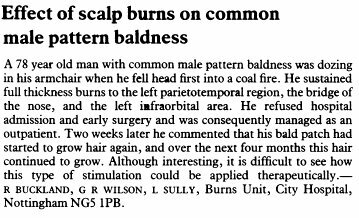 If this was a real case of baldness cure, this would have been studied more deeply, and today we would have a lot of information about this phenomenon. The fact that today this phenomenon is basically unknown, means that these documented cases were not truthful. » angle of the photo to compare with the other photos and see the regrowth. » That’s what I’m interpreting from the text and photos. » » From the photo I would say these hairs are 1cm long or so at 2 weeks. » » Normal growthrate is 1.2cm/month. » » many years of total baldness. » » scalp (eg 5mm), so just to reach the surface would take certain time. » » prepare the root before a solid hairshaft can start being produced. » » » This isn’t a suprise to me at all. » » » Munster AM. » » » interventional mordalities will need to be used. » » » he had enough stem cells in the area to make new hair. posting links to Rassman site? has he done it before? » » Stop shilling, roger. » posting links to Rassman site? has he done it before? I think there is a good chance he would still be alive today. I knew Michael Jackson (I was not a close friend, just an occasional acquaintance but we got along well)… I think that Dr. Rassman or some other HT doctor who performs surgery very similar to Dr. Rassman could have saved Michael’s scalp. I think Michael’s baldness was partially responsible for his depression and that kicked everything over into drug dependency and his career decline. » is still without hair (although it is difficult to see). » hair and as a result, became bald (it wasn’t bald before). » documented cases were not truthful. Not going into probabilities but as you say think with logic,you must see that some info’s that you present as facts in your analysis should be suppressed, or at least, a just sense of validation should be observed in treating them. So,when you say ,I quote "In the 6week photo you can see that no hair is growing in the burned area (left), even though it is almost completely healed " - You arrived at this result, as no other hypothesis would meet the facts.Perhaps hair was growing,but you (we) can not see it on that presented photo. You see what I mean?You have not eliminated that hypothesis as impossible,and therefore it might be the truth. And when you say “If this was a real case of baldness cure, this would have been studied more deeply, and today we would have a lot of information about this phenomenon. The fact that today this phenomenon is basically unknown, means that these documented cases were not truthful.” - you must also see that it doesn’t mean that at all.It doesn’t mean must.You can’t use such method of exclusion if you employ logic as you say you do,because again,many other hypothesis could exist as to why this phenomenon was not explored all this time. i kind of worry that it might be an anomaly were somtimes it works and sometimes it doesnt. maybe only in some people although i dont think that makes sense since were all human either way were missing something important which is costing precious time.